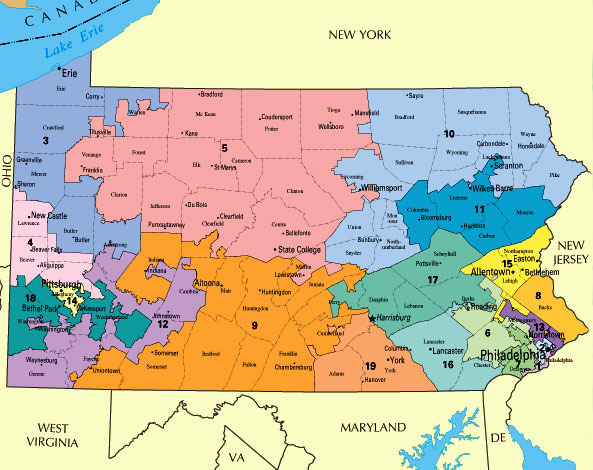 As discussed in the March 31 posting here the Pennsylvania primary is by congressional district, of which there are 19. Here is the map again. Today, CQ Politics looks at the details of each CD and how the delegates might be split. Here is a summary of their analysis. Thus it could happen that Hillary Clinton gets 55% of the vote and net a total of three pledged delegates. Fortunately for her, there are also 35 at-large delegates that split in proportion to the popular vote and also 20 PLEOs (mayors and local officials who have to campaign for a delegate slot). If she gets 55% of the popular vote, she would get a net of three at-large delegates and a net of two PLEOs. Thus if CQ Politics has it right on the districts and also if Clinton gets 55% of the popular vote, she will probably gain a net of under 10 delegates from the primary election and Obama will probably win most of that back in North Carolina two weeks later. After that, there are no big states left so the delegate totals will not change much until the superdelegates go public. Clinton is running a new ad directly attacking Obama for his comments on Pennsylvanians. In her earlier "3 A.M." ad she implied she would be a better leader in a moment of crisis. The President is commander-in-chief and alluding to your strengths and your opponent's weaknesses for that role is clearly legitimate. The message was: "I will be a better commander-in-chief." However, the new ad is a direct, frontal, personal, bet-the-farm, attack on Obama. It is an attempt to keep this issue going as long as possible. The fight is really about which word do you use to describe middle-aged white blue-collar workers who lost their job in the steel industry and are never likely to get as good a job again. Are they "bitter"? "Angry"? "Despondent?" Why does the specific word even matter? Why aren't the candidates falling all over themselves explaining how they are going to fix the situation? Obama, for example, has emphasized rebuilding crumbling infrastructure. Clinton has talked a lot about her health care plan and Pittsburgh has a booming health care industry. She could talk about how covering more people would create jobs in the health care sector. This ad will be very controversial. Check out the ad here. The downside of this kind of politics, though, is that it makes all politicians be afraid of saying anything spontaneous any time to any group. It is far safer to read from a very carefully worded vague script that says nothing and offends no one. We have some new polls today. Here they are.